...to wish people around the world a great time with friends and family, a time to relax and reflect on what has happened over the last year. Certainly it is also the time of the year where certain wishes from previous years are repeated, because they simply are precisely what you want to express and so I will just rehash a nice Frostfell message from a few years ago (I think I could be running for presidency with such awesome efficiency skills, couldn't I?). Enjoy the season of the year with your families and friends, be jolly, celebrate and overall have a wonderful time! For myself I can only say that while being grateful for all my friends living close by, I am also indebted to EverQuest forever, as it has brought me some new friends from around the world (many of whom I had the pleasure to meet face to face) without whom my life would be so much poorer. People who don't share our hobby often look down upon us because "it is only a game" and "you should interact with real people more than being in the virtual world", but all I can say is that I am truly grateful for having met so many great people, some of whom I consider among my closest friends. Does it really matter if you live in the same city or even the same country? Being there when you need someone to talk to, cheering you up when you are down and in the same way letting you yourself participate in their lives - that's what friendship is about in my book! The internet brings possibiLities to our generation that none before has had and from my point of view what could be better than to try to learn about different cultures by the people themselves? Aren't all those "internet relations are not real"-sayers closing their eyes to the new oppotunities we have? There is a whole world of people to meet out there and during times like these I would like to express my gratitude for all the precious memories I have gotten by starting EverQuest 15 years ago. Yes, this is a bit sentimental, but what more appropriate time to reflect upon all the great people we have been priviliged to meet over the years? 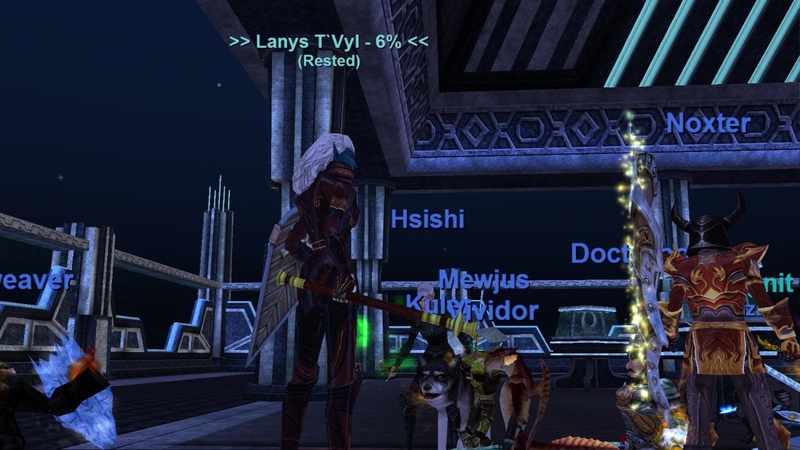 EverQuest still has people playing not alone because it is such a great game, but mostly because of all the bonds which have been built over the years. Some people may leave, but many still stay in contact even years later and that is what counts. While I was in Nottingham my guild was so nice to wait with winning the final event in tier 1 of the newest expansion of EverQuest called The Broken Mirror (TBM). As I did miss the start of the expansion itself (Las Vegas > Norrath, sorry guys), I have simply forgotten to make nice screenshots, so all I can say is that I will put it on my list of New Year's resolutions to make better news in 2016! So from the bottom of my heart I wish you all a great time, may you have a splendid finish of 2015 and a great start into 2016! After quite a few weeks of banging our heads against the event, tonight finally everything fell into place and we managed to beat the last event from The Darkened Sea called Calix Quirinus and Lanys. Yes, once again Lanys T'Vyl was used as an adversary, what a novel idea! Anyway I have to admit that in this last incarnation that Darkelf lady was a real pain to fight. There was quite a bit going on (emotes, AEs, knockbacks, liches), but the most annoying part of this event from my point of view were the spark workers (some golems), who had a tendency to attack casters despite OTs using all their tools to get them controlled. I have never found events particularly amusing where certain classes were hindered to do their job properly. Yes in the end we worked around it (also the time between the golems blurring themselves was prolonged in a patch), but nonetheless I find it frustrating when you try to get a mob OTed properly and on a wimp the mob turns and runs to a freshly rezzed caster who didn't do anything to it - sorry, but that is simply retarded. 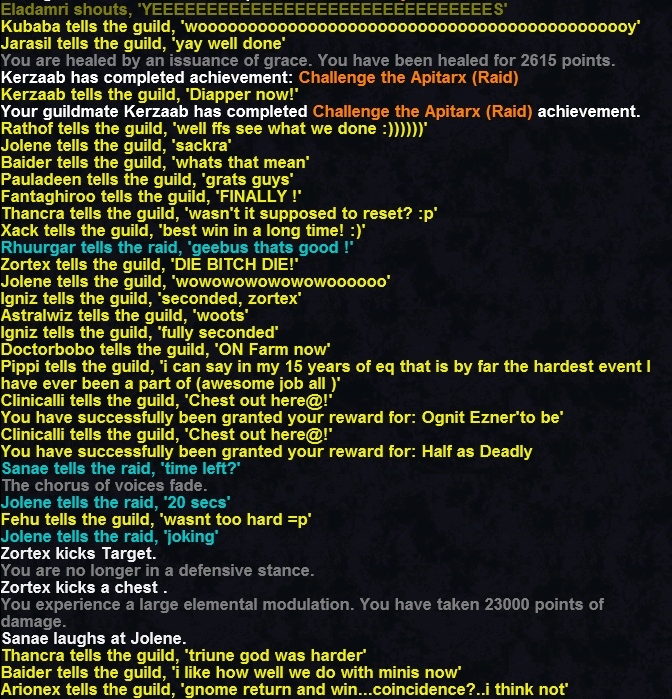 These are only those who were inside the raid upon the final attempt, but I would like to congratulate all the members of Raging Fury on finishing another expansion of EverQuest. While we have dropped out of the top 5 guilds (and actually also the top 10) lately, we still do well enough for such an old guild. 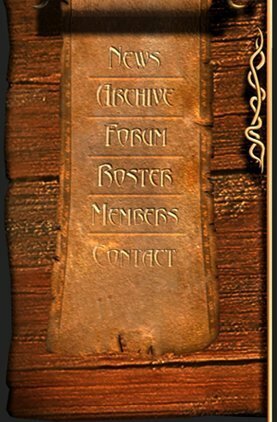 While many other guilds on our server Antonius Bayle have fallen over the years, we still stand strong and provide a new home for some of those who would otherwise have been scattered across multiple guilds. Of course it is not always easy to integrate a huge number of new players into an old structure, but after a time people start to learn to coordinate and feel comfortable in their new surroundings, making the guild in total stronger. This has happened to our guild with the influx of not one, but two groups of players from other guilds on the server: Wind of Tranquility and Darkwind. 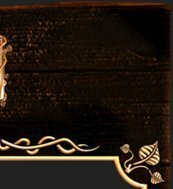 Working side by side for a common goal is the best way to overcome barriers which always exist between rivaling guilds and I think that over the last months our new guild members have come to accept Raging Fury as their new home. I will write a bit more about my personal verdict on TDS on one of the next days, but I do not want to finish without saying a huge "Thank you" to all of the team who have made this victory possible, first of all our main raid leader Nilzera, but also Rhuurgar who has lead many raids in TDS too. Second I want to thank the other officers Jarasil (great raid leading there too), Vmas (you still rock for doing the pesky RFP snaps) and our newest officer Washu for being a fearless bunny. Last but not least I would like to thank two people who are not members of our guild anymore: Fehu and Dantius. This may seem unusual to some, but both have worked really hard to integrate all those new members, to keep the guild on track and they both have left less than two weeks ago. Your work inside RF is not forgotten! Dear valued reader of the Raging Fury news: I am proud! 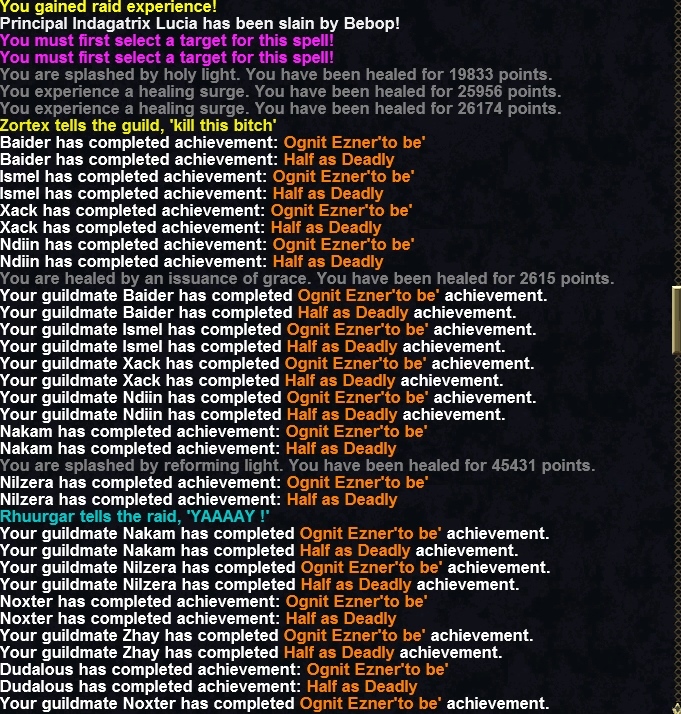 No, not of myself because I managed another update only 5 weeks after the last (I am accepting pats on the back though for such an accomplishment), but of my guild who managed to down the fourth event in Arx Mentis called Principal Indagatrix Lucia yesterday evening. Anyway, beating this took us a bit longer than expected, but not all of that delay is to blame on our admittedly more casual approach (compared to the times when we were constantly among the top 5 serverwide). As those who are still following information around EverQuest most likely will already know, Sony has sold its daughter company Sony Online Entertainment (SOE) to an investment company called "Columbus Nova", so SOE is now called Daybreak Game Company. Aside from the usual lay-offs which happen after such changes (hopefully followed by new hirings) there was also a change on the patch times for EverQuest which hurt the Euro players pretty badly. That change alone cost us two raid days, otherwise I think we may have beaten Arx 4 last week already (not that it really matters anyway). Still we hope that future patches can be moved out of our main time again. 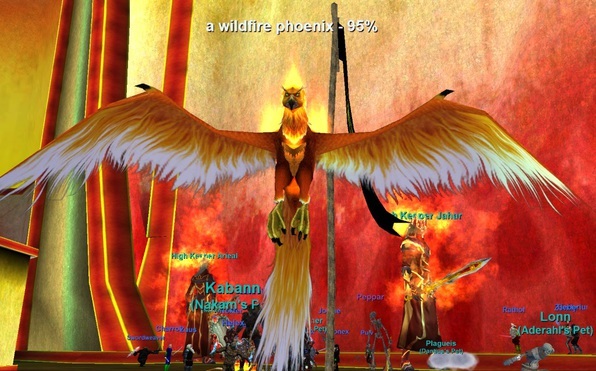 Apart from that we are all anxious to see how Daybreak will handle the current problems in EverQuest and if they will rectify some of the mistakes recently made by SOE (namely the so-called "XP-nerf" when players below 100 were grouped with players level 101 and higher and the huge reduction of exp for all zones below CotF). There is no denying that EQ was not given the resources needed to maintain a healthy game which then lead to more people quitting, leaving it with less resources... a vicious circle. We can only hope that Daybreak (or Columbus Nova) is seeing things from a different angle than Sony and maybe supports the game in a way which actually brings back some of those retired folks and maybe even gains some new enthusiasts. Having more content than 5 progression raids and two so-called "one-off"-raids and a miniscule number of zones could actually help with that. What is a "one-off"-raid you may ask if you aren't in the game anymore? Well, that is a raid you can only attempt one time, the lockout gets activated when you trigger it, not when it is beaten (a bit like Corniav during PoP-era). No offense, but putting this mechanism in on two from only seven raids in total is a blatant and open attempt to make the content appear bigger than it actually is. You can only attempt it once every five days (meaning for guilds like RF once a week) and there is a good chance that some of the stuff you learned you forget again until next week without training inbetween (or there is a change in the raid force with some new members). Now, I wouldn't mind something like that if we had 20 raids of which two were of this type, but when you only get 7, then this is simply an extremely bad and annoying idea which in no way is making raid more fun! 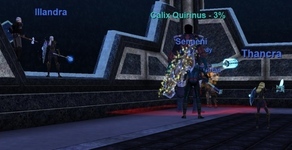 The brand EverQuest should still stand for something, so we can hope that Daybreak may listen a bit more to the players and the devs may also have to be a bit more understandable that people who are not enjoying the game will actually leave. Putting fingers into ears singing "lalala, I can't hear your whines about not enough content, timesinks via spelldrop rarity and exp-nerfs" has cost EQ too many good players already. That's all for now, folks, the last update should come when we have finished the last progression raid and then I will also give my personal verdict on the expansion called The Darkened Sea (as if you couldn't read it between the lines already). Dear revered reader of the Raging Fury news! I am rather proud of myself! I have managed to reach a new level of slackness by giving you the last news from 2014 almost four weeks into 2015 - a new record even by my standards! There have been different reasons why the number of news has been extremely low, some of them indeed strictly related to my personal life, but part of the praise for this new level of sloth belongs to SOE also, as they are continuing down the road of smaller releases when it comes to the raid game. It simply does not make me very enthusiastic to post about one of five raids in total, even though I have to admit that these raids are not a simple "walk in the park", not at all. Raging Fury has beaten the first three events so far even though we reduced our raid days quite a bit during the last days of 2014 due to the celebrations going on at that time of year. 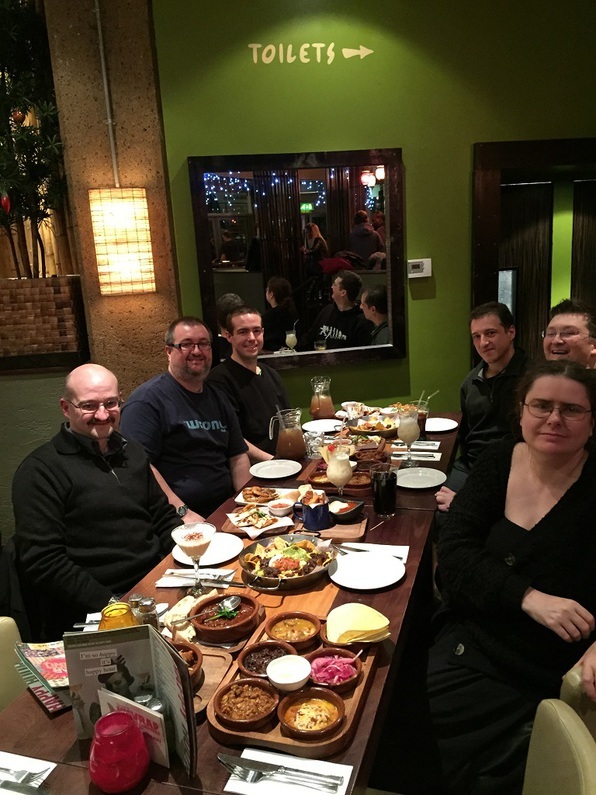 Also there was our traditional RL meeting in Nottingham again in December, organized once again by our dear Illandra, where the loot was simply far better than some old dusty Breastplate in a chest in Arx! But why don't you judge by yourself, would YOU pass on delicious Tapas, pitchers of Long Island Ice Tea and the company of friendly folks like these? Well, as it was so nice on Friday evening, we simply had to travel around the world on Saturday at the Red Hot World Buffet after watching the last Hobbit movie together in IMAX. Sorry, but whatever battles we fight in EverQuest, they cannot compete (at least not for me). 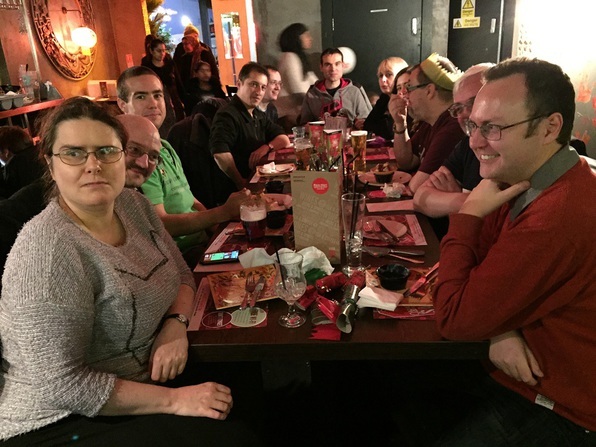 To be perfectly honest, EverQuest doesn't have the same appeal to me as it once had, but meeting people from around Europe (or from the states for that matter *waves to the folks from the meeting in Vegas in October*) just shows what a tremendous impact it has had on many people over the years. Those friendships keep me in a game that is certainly neither as beautiful in its graphics nor as modern as so many other games. EverQuest simply has a community unparalleled in any other game I have tried out so far and to me that is a very important part of it. Anyway, back to the current expansion, The Darkened Sea. Some long time players will have noticed the similarity of the name to The Buried Sea from 2007 - and certain aspects indeed have been taken over, for example the small number of raids (mind you, back then expansions were coming out twice a year and "low" meant 7 events in TBS versus 5 in TDS). Oh, and if you wondered. no there is still no "ship-to-ship-combat", which was promised us back then in 2007 - what a surprise! 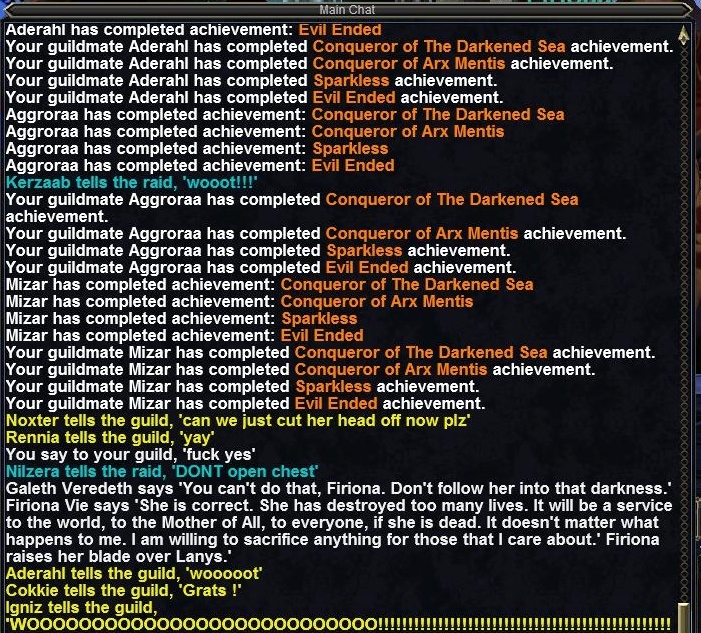 As written before we have only beaten 3 out of 5 raids, but as to this time this is a fate shared by most guilds in EverQuest we aren't too depressed (yet). The usual suspects from ROI have finished it quite some time ago, so my customary congratulation once again to them - well done! Well OK, maybe not always, but we do stick to a topic, once we work on it! Want to be a part of a guild which has fun while raiding (maybe sometimes too much fun? ), then contact Fehu, Dantius or Illandra or one of the officers, we have spots in many classes open. Dear regular readers of Raging Fury news! I have to apologize to all of you. Not only is this a rather small update this time (as the last one hasn't been THAT long ago), it is also far too late, as we have beaten the last progression event already on the 11th of August, so nearly two weeks ago. I could come now and blame global warming causing floodwaves to ovErflow my apartment or maybe aliens abducting my PC, but I want to be honest with you and simply say that I had other things on my mind and forgot. That out of the way let's talk about the two last raids we have beaten. So, all of the progression is done, but there is still one raid to beat, the one in Plane of War which came out as "anniversary raid" only to be later officially changed to "permanent", as noone even bothered with it at the start considering its rather high risk vs. reward. Since the event has gone through a retune it has been beaten by more guilds than just the ruling "King of the Hill" Realm of Insanity, so Raging Fury will have a second look at it too now that apart from it only farming is left. 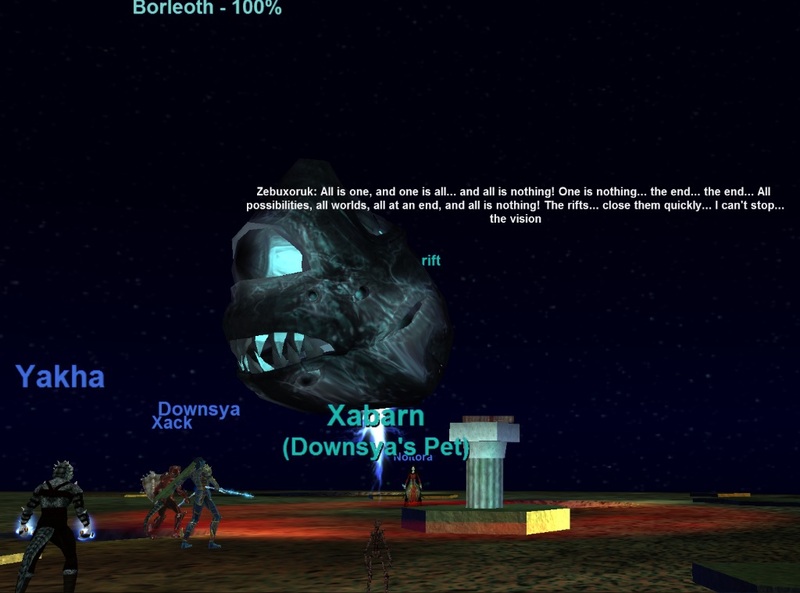 That's all for now folks, see you in Norrath maybe! It has been a while since I have posted any news (as Jolene was so kind to remind me every other week *sigh*). While I have to admit that part of this lack of inspiring words from the fearless leader of Raging Fury (aka. me) is due to my own sloth (there is a reason why I get called Slackrahil by some), that is not the only cause. More about that in the second part of these news, at first I want to get the important information out: Raging Fury is back on track by downing Tower of Rot (the first and only event in Tier 2a) finally! OK, so why is this important? I mean, RF has been a high end guild for so many years and now we are happy about beating an event more than a month after two other guilds on AB (grats to them!)? After that everyone was awake though and it was easy to see that the difference it makes when trying an event with a balanced full raid force versus missing almost 2 groups and having people bringing in bots for certain classes is tremendous. So we got the event down on the very first attempt yesterday, which I found really impressive considering quite a large number of the new guild members had never even seen this event before - great job everyone! There is a reason, why Illandra is called the "paladin classleader" in RF! Seriously guys, we know your class is nothing compared to the shining knight, the epitome of chivalry and greatness (and mostly curing) known as the paladin, but no need to commit suicide - it's OK, we like you anyway! I am pretty sure we will be able to beat the two last remaining raid events in reasonable time and I might actually post another update then (no promises! ), but for now I would like to explain why RF had to struggle the last months (and why I fear that this might be the same for some other guilds too). Whatever it was, everyone knew that this process would take a bit of time to get through and that even if the expansion was released on a Wednesday it would not be a huge disadvantage to have your first raid day after that on Sunday. 3 days more or less wouldn't make or break the success in total, it was something between an 800 to a 10000 meter race until you finally beat the expansion and felt something like accomplishment (well, not so much after beating Lord Brekkt, what a poor excuse of an endboss, he must be the laughing stock of his colleagues Tunat, OMM or Triunity, heck even Vishimtar). Anyway, fast forward to the current state of the game... expansion release was October 8th 2013, all available raid content was beaten by the very first (RoI and MS) the same day. Pretty much the same picture with the releases of tier 1b, 2a and now 2b. First day out - finished. Feels like 4 50 m dashes instead of the race length described before. Don't get me wrong, I am sure RoI and MS would be the first two to finish also if all content was released at once and if some sort of flagging would be involved, stopping them from finishing all on the very first night. The way though it is now is simply a bit demotivating for many people used to a different setup. Add to this the general attrition during summer and you get a dangerous mix for many raid guilds who cannot relax during the summer by farming known content with low numbers as they used to. They need to beat newly released content (hey, they consider themselves high end after all), but have issues getting enough people online because people do other things during summertime too, not only EQ (see above). So now they can't beat the new content, thus people who are still online get frustrated and don't log in, others leave for greener grasses (as even some of those finishing earlier now face number issues) and the end result is that a former high end guild is struggling. This is something which could be totally avoidable by not bringing out new raid content during the summer months and I really hope SOE can rethink their strategy on releases, because the current course is dangerous.